Hello! It’s good to finally have this post ready! I’ve been delaying and putting this off for months now. I hope you can forgive me! The Little Twist has been getting so much attention, I can’t thank you all enough! My heart goes out to everyone who gave the project more exposure than I would have expected, and especially to the members of the Industrial Design group on LinkedIn, for being the best critics ever. A lot of their insights and suggestions helped me look at Little Twist from a completely different perspective. Also, do check out the portfolio of the talented animator, Jahnvi Shah! She drew the illustrations for the “Usage” instructions page of the project. The Little Twist, much like the Black and Decker semantics project was done two years ago, in haste, to comply with a project deadline as a student. It was only post graduation that I decided to develop further on the concept and give the idea more substance. The original Little Twist design was just one image that looked somewhat like this. The older design wasn’t particularly different. I experimented with two different types of handles. Additionally, I (hasty and bad judgement on my part) decided to put a separate dedicated hot water faucet too [Top Left]! I still held on to the over-all idea, making a mental note to do a better job later on. The course this was a part of was titled Emotional Design. The objective, to design a functionally sound product that the user would instantly want to own/use/flaunt. When the idea first popped in my head, it seemed like one of those solutions that seemed so obvious, it made me wonder why it hadn’t been implemented already! The design appeared in my head as in the image above and I simply stuck to it. The pouting flower-ish faucet looked unique, refreshing, and lovely. I only altered it later, judiciously, while figuring out the inner workings. The spout changed over time. 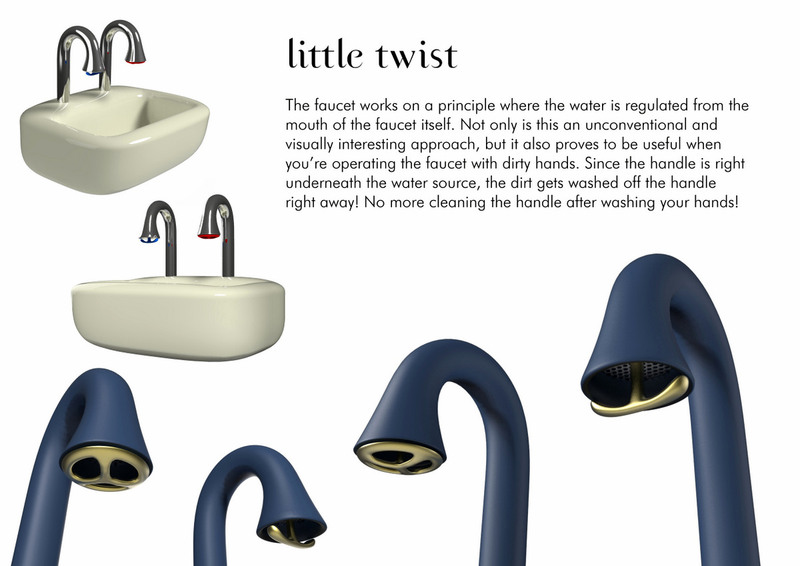 The initial Ideas aimed at making the turning of the faucet handle more functional and pragmatic. I later on went to develop the handle, the main element, into an aesthetic/emotive element. After seeing that the previous design lacked a certain appeal, I re-designed the handle, trying to take inspiration from water. Below are a few explorations. For upward-downward/sideways actuation. However, the water wouldn’t necessarily clean inside the hole well. Turn actuated, but a little abstract. Plus, water may not clean the underside of the prong converging point. For turning style operation. Most natural way of operating a faucet. The final design was chosen for its simple appeal and method of usage. (Fear not! Even with its elegant and slim design, the ceramic handle isn’t particularly fragile. It is constructed with a sturdy metal insert (preferably brass, or stainless steel). Most people who saw the design commented on the lack of a mixer for hot and cold water. Many suggested that the design have an extra knob, for water regulation, or the pre-existing handle have an upward downward (push operated) motion for water velocity and a sideways motion for temperature control. After a lot of considering, I decided that maintaining the single-function (water velocity) turning knob was a better decision than having an additional temperature mixer, and thereby adding to the learning curve. There were a few reasons that led me to take my current stance. The first being the image on the left. A lot of the appeal lies in the simplicity of the solution, and adding complexity to the solution seemed like a bad bargain. 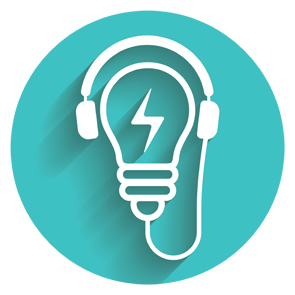 Products connect with their users through the experience. We always use the phrase “turn on the water” or “turn the water off”. It’s the most instinctive thing we do, with faucets. Taking that function away, or corrupting it with an additional function would just ruin the experience. Another reason that persuaded me to choose this design direction was my immediate environment. Here in India, most homes reserve their hot water for just the bath. Hot water is considered a luxury, and is used sparingly, mainly during winter. Most houses get access to hot water at only certain allocated hours of the day. So the prospect of having hot/mixed water in the basin is a rare one. Building the Little Twist is a lot easier than it looks. I’ve gradually made a shift from using Rhino 3D to Solidworks, but for organic modeling, I can’t help but going back to Rhino! This is only because of an amazing Rhino Plugin called T-Splines, by the folks at Autodesk. It allows 3ds Max style polygon modeling in Rhino’s NURBS Environment. They’ve even made a bridge plugin that allows you to drag the same model into Solidworks and manipulate it (tsElements). All three main components, i.e., the Tap, the Handle, and the Basin, were modeled using T-Splines. They were then carried into Solidworks where they were assembled together. The inner components for the tap were created in Solidworks as a sub-assembly. Another highly ambitious idea I had was to model actual drops of water coming out from the tap. For this I used Blender3D. Blender is one of the most amazing yet highly underrated softwares out there. 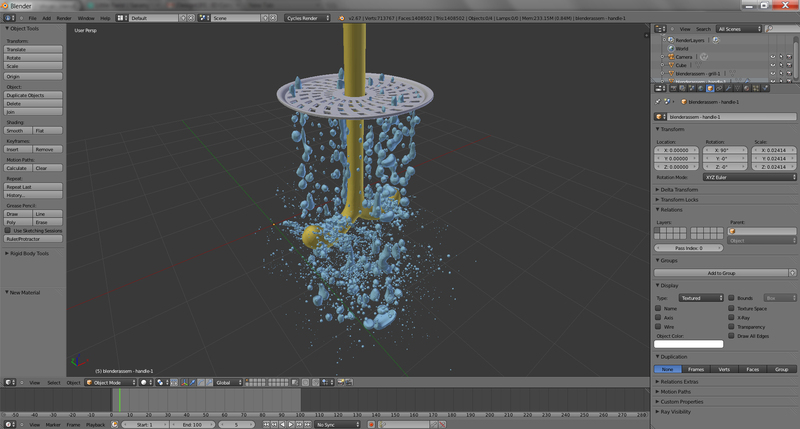 To make the droplets, I used Blender’s fluid simulation option. It took me quite a few tries (and almost a fortnight) to get the desired result, but when I dragged the model into Keyshot, the results were absolutely hypnotizing! 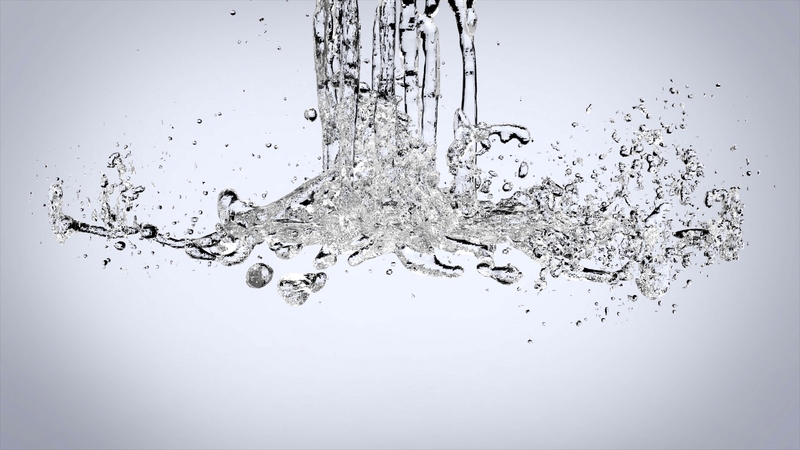 An initial fluid simulation attempt. Rendered in Keyshot. Don’t forget to check out Blender. It’s a free-to-use software with TONNES of features. Also, you should take a look at www.blenderguru.com for some amazing tutorials. Not just on fluid simulation, but in general. That’s it. I’m all ‘tapped’ out! Putting the project together after that was a breeze. Credits to Marios and GrabCAD for the Bathroom Counter on which the Little Twist sat so gloriously. I can’t thank Jahnvi Shah enough for the illustrations! Also, credits to blenderguru.com for the fluid simulation tutorials. Thanks to everyone who shared, appreciated, and wrote about this project! Yanko and DesignMilk have been exceptionally instrumental in putting this project out there. If you’re interested in writing about this project, you can download the Little Twist Media Kit HERE. That’s all for now. Hope to see you really soon. I’ve got some really amazing new projects coming your way, so stay tuned!